Data flow diagram (DFD) projects an overview of an information system through representing the production and receive of 'data'. Visual Paradigm features all the DFD tools you need to draw professional DFD and generate complete DFD specification. You can also link up your DFD and business process diagram (BPD) for connecting your system processes and business activities. 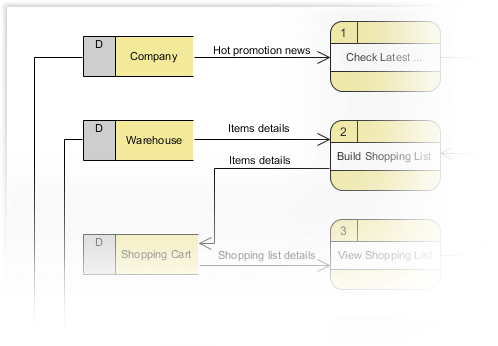 Conveniently transform process, external entity, data store and dataflow into Data Flow Diagrams. Develop and efficiently refine the system. Data specification can be generated and shared with your teammates and customers. Draw both DFD and BPD then link them up to display the interaction between users and the system data.